Android Fonts Changers is a best thing to make awesome look of text because many of time we see that having a vanilla OS in mobile. So most of time we don’t like the default fonts, Which are uses in android. Also Have a look On Best app For rooted android In a Samsung mobile we can change the font but we can’t do it in other android like Micromax, Karbonn, Moto, Naxus etc. Because Samsung have a inbuilt font changer but in other phones, there is no any option to change font. 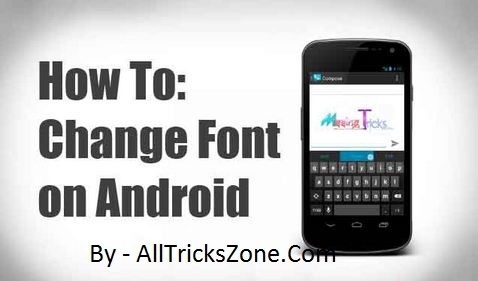 So if you wanna change your Fonts then this Easy Guide specially for you to how to change Fonts in android. personally, i like cool jazz fonts and guys i would like to help you in 2 apps in which both apps changes the fonts and apps are having different function of changing handwriting. Both Apps are required Root Permission but the only thing is that you can install your choices fonts in one app and in 2 apps you can install what handwriting you want to install they will suggest you to download. This application is also available on Google Play Store like Hifonts, but there is not much handwriting available in this apps and there some of which you can install and use it in, this fonts’s Extension in in a format .ttf for example if i am having a file name as cool jazz.ttf so i can simply install the handwriting fonts from this application just go to local and install your favorite handwriting as show below. Must Try – Make Single Name Facebook Account. So guys above is a easy method of Changing fonts in your Android Phone will give you a new look as well Feel Well, This Guide is for rooted mobile phones only. So before following this easy guide, make sure your mobile phone is rooted for change stylish font in android. So stay tuned and keep visiting AllTricksZone.Com, If you face any problem or having Issues feel free to comment below section. Will Hifont App will work on Non rooted phone ?